A dust storm sweepsacross the border of western Chad and southeastern Niger this true-colorTerra ModerateResolution Imaging Spectroradiometer (MODIS) image from February 4,2003. The dust is likely from the Sahara Desert, across which this stormis blowing, and it leaves light tan diagonal streaks against the orangeland. South of the Sahara where the borders of Niger, Chad, Cameroon, andNigeria meet is Lake Chad and its surrounding marshlands, which appeardark green and brown. Lake Chad itself sits on the border of Chad andCameroon at the very center of the image, and is a slightly lighter greencolor than the marshland. 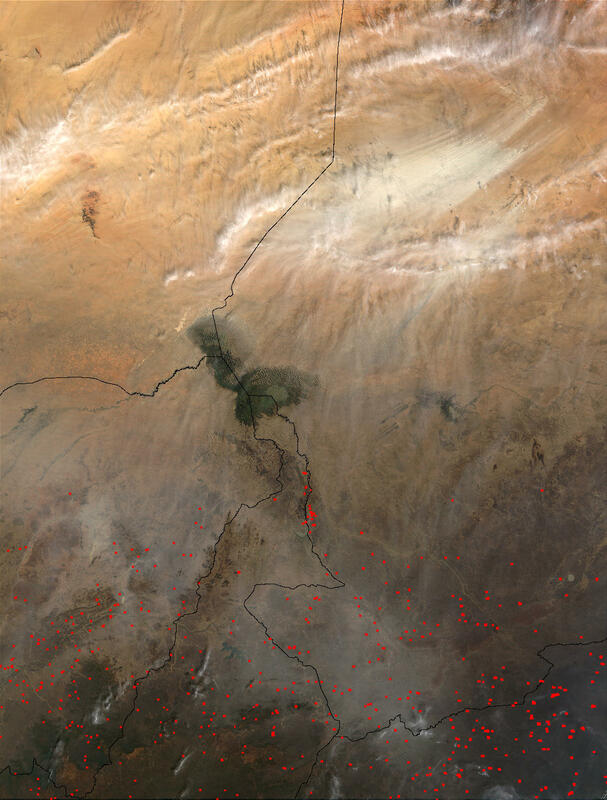 Scattered throughout the bottom portion of theimage are a number of fires, which are outlined in red.